Give yourself and advantage and make your business card stand out from the crowd by using colour and design that is visually attractive. 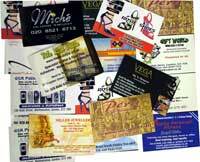 These are Professionally UV OFFSET printed, High Quality paper Business Cards. Full colour printed with glossy lamination. This is the cheapest and most popular series.